Gator Connect is the place for student and alumni engagement. 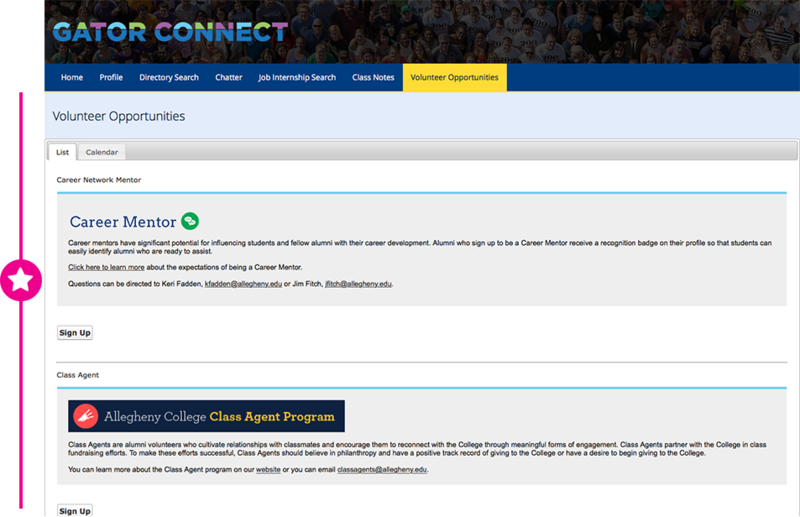 Whether you’re looking for a job or trying to connect with your first-year roommate, or you want to become involved at the College, think of Gator Connect as a launchpad to get you started. Need help navigating how to use Gator Connect? Click on a topic below to learn more about the many things you can do within our community. 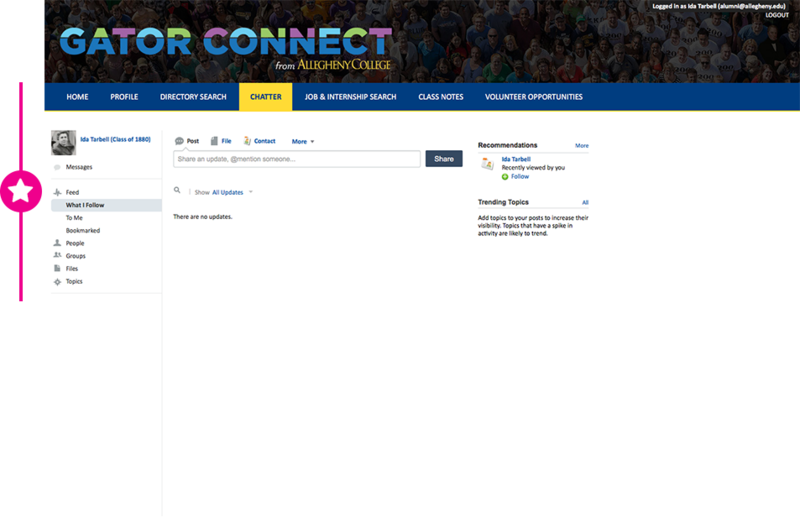 Keep your Gator Connect Profile up-to-date so friends and former classmates can connect with you and current students can network with you. Keep your Gator network strong! There are six areas in your profile section. Below are detailed descriptions and instructions for each section. The Profile section tells other Gators more about you. 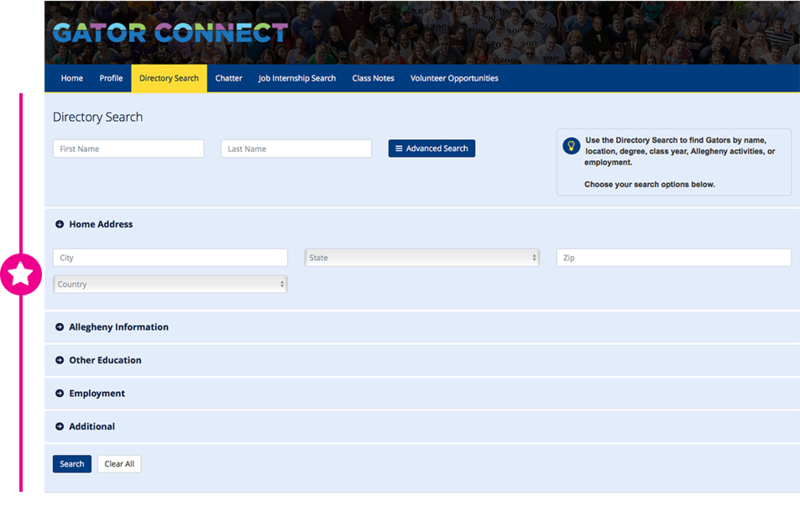 When viewing your own Profile, you will see your Contact Information, Engagement (volunteerism and giving history), Academic, Employment, and Preferences. Keep reading for more information about each of these areas. 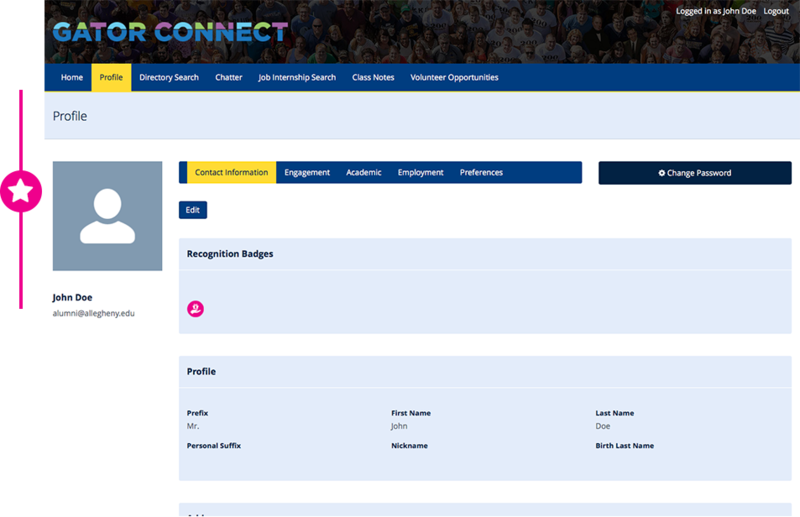 When looking at other users’ profile pages you will only see Contact Information, Academic, and Employment. 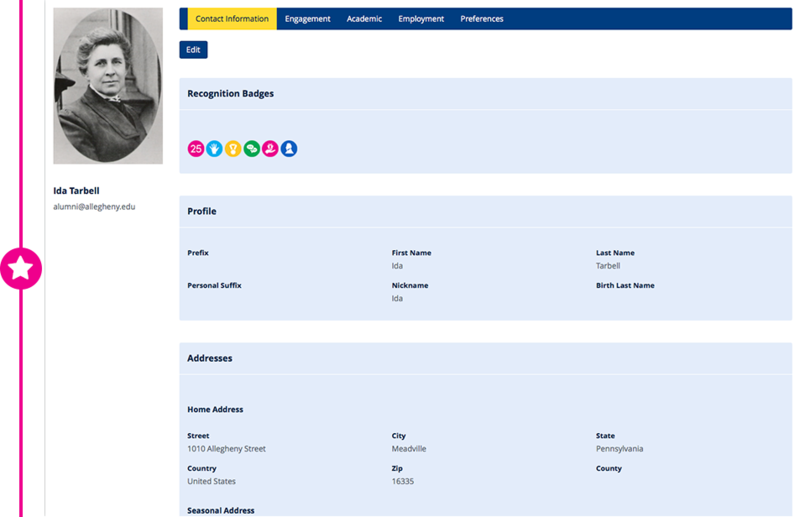 This page shows Recognition Badges you have earned through your engagement with Allegheny, as well as your current addresses, email and phone, birthdate, “About Me” description, family members, and Class Notes. Make sure you add a recent photo of yourself! Click on the “Edit” button” at the top of the page, then click “Change Profile Image.” You will then be asked to upload a JPG, GIF, or PNG file. Maximum file size is 8 MB. To make a change or to make information private to other Gator Connect users, click the “Edit” button located at the top or bottom of the page. When you are done making changes, click the “Save” button located at the top or bottom of the page. 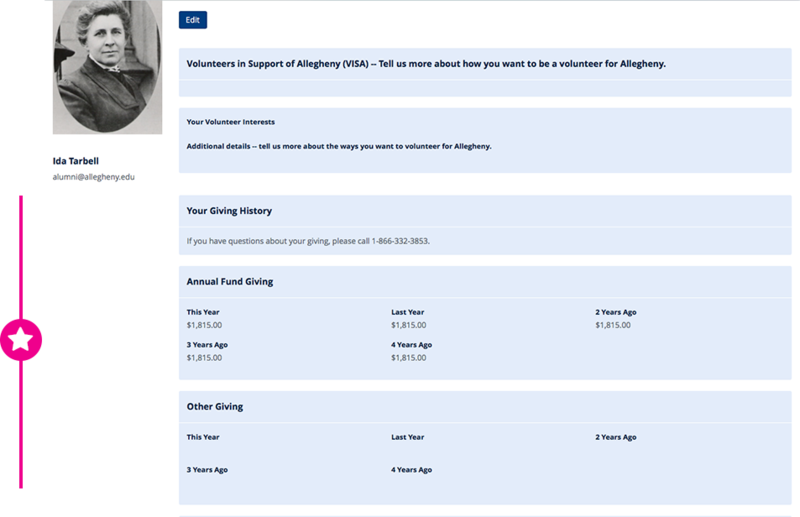 The Engagement area has two sections: Volunteers in Support of Allegheny (VISA) and Your Giving History. This page is only visible to you — it is hidden from other Gator Connect users. Volunteering your time and talents is fun, easy and an impactful way to give back to your alma mater while also making a difference in students’ lives. Click the “Edit” button located at the top or bottom of the page and select volunteer areas of interest. After you have made changes, click the “Save” button located at the top or bottom of the page. By adding this information to your profile you are connecting with the offices, academic departments, and current students who are seeking alumni support. 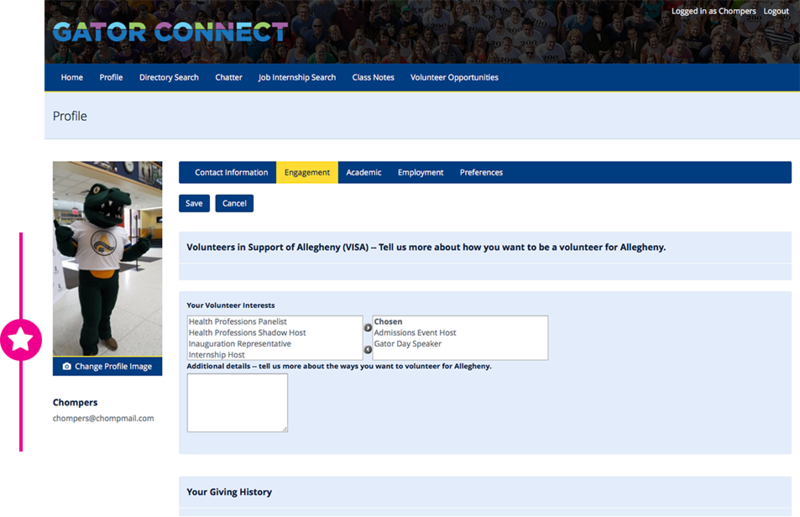 You also can view a list of your current and former Allegheny volunteer activities. In this section you can view a confidential summary of your recent Giving History. Since its earliest days, Allegheny has depended on the generosity of donors who believe in the mission of the College. Your financial support ensures that Allegheny can provide an outstanding liberal arts education for students. Learn more about how your gifts make a difference for faculty and students and the ways you can support Allegheny financially. If you have any questions about what is listed in this section or making a gift, please call us toll-free at (866) 332-3853. The Academic section displays your Allegheny Degree Information, Student Involvement (as an undergraduate), and Other Degree Information (degrees earned from other colleges or universities). On this page you can change/edit your Allegheny Student Involvement and degrees received from other colleges and universities. To make changes or edits, click on “Edit” at the top or bottom of the page. 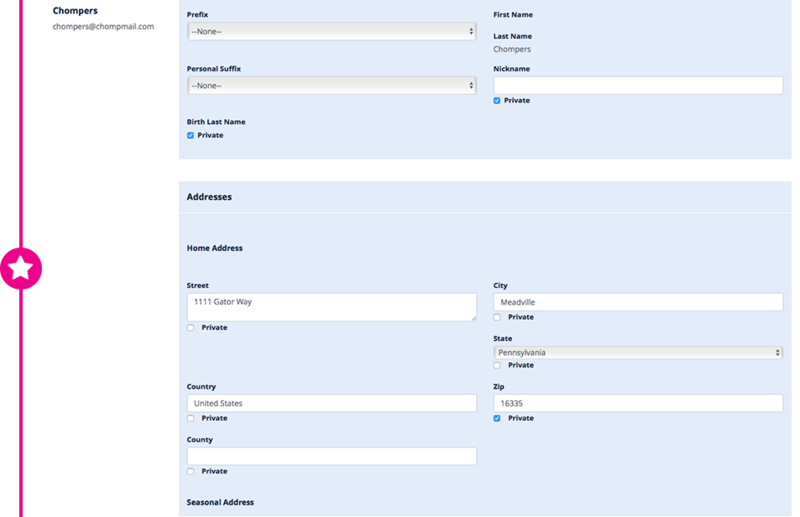 While in Edit mode you also can choose which information you want to display to other Gator Connect users. When you are done, click the “Save” button located at the top or bottom of the page. 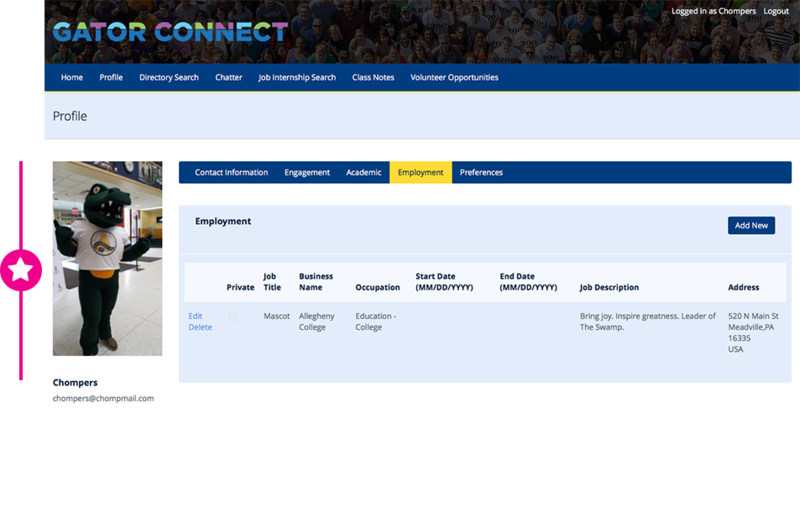 The Employment page contains current and former places of employment. This information is especially valuable to current students as they seek the advice, wisdom and mentoring of alumni who work(ed) at a particular company or in an occupation they might like to pursue. Providing career insight and networking is one of the most valuable ways you can help current students. Please keep this information up-to-date and visible in Gator Connect. To make changes or edits, click on “Edit” at the top or bottom of the page. When you are done making changes, click the “Save” button located at the top or bottom of the page. The Preferences section allows you to completely hide your profile in Gator Connect, which means your name will not appear in search results and other users cannot see your profile. In this section you also can manage the types of email messages you want to receive from Allegheny. To make changes to your preferences, click on “Edit” at the top or bottom of the page. Once you are done making changes, click the “Save” button located at the top or bottom of the page. Please Note: if you hide your profile in Gator Connect, you will be hidden from all other users. If you prefer, you can hide select portions of your profile, instead, by managing the privacy settings in each individual section. Doing so allows you to appear in searches, but you can choose which information you want displayed. 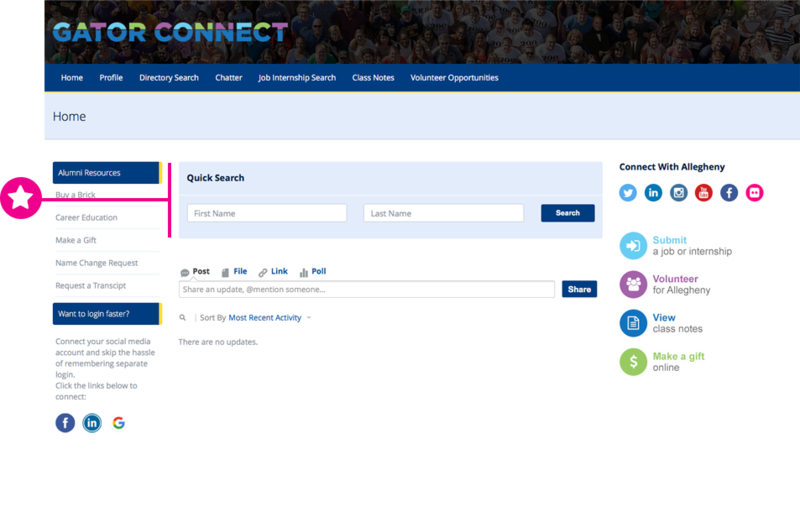 If you already know the name of the person you are looking for, use the Quick Search box located on the Gator Connect Home page. Type in a first name, last name, or both and hit enter. 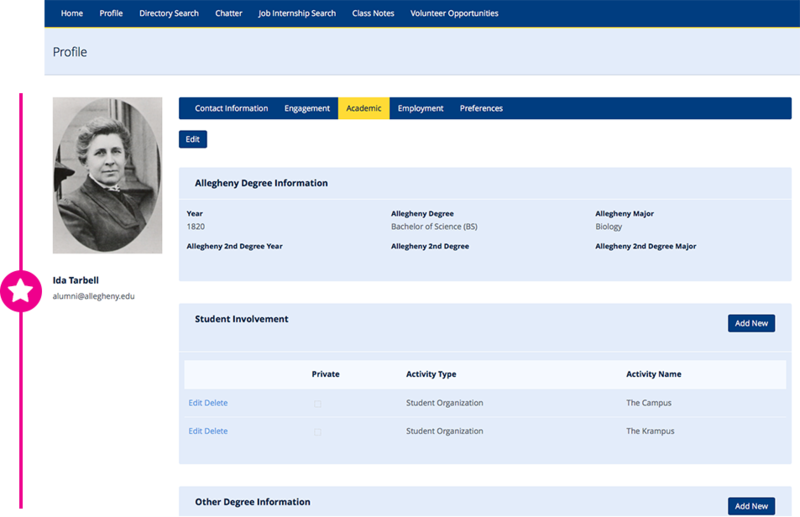 Use the “Advanced Search” tab to perform more detailed searches using criteria such as name, location, degree, class year, Allegheny activities, and employment. Click on the arrow to open additional search options, enter your search criteria and click “Search.” The results will appear at the bottom of the page. Results can be sorted by Last Name, First Name, and Class Year. The badge icons in Gator Connect recognize and celebrate all that you do for Allegheny. Your investment as a donor, service as a volunteer, and assistance as a career mentor are reflected on your profile. Learn what each badge recognizes below. The Board of Trustees has fiduciary responsibility for the governance of the College and monitors the institution’s broad policies. Alumni Council members serve the Alumni Association to strengthen the bond between alumni and Allegheny College, its students, faculty, administration, and Board of Trustees. The Blue Citation is awarded in recognition and appreciation of outstanding service to the College. Donors include anyone who has given a financial gift to Allegheny this or last fiscal year. Volunteers in Support of Allegheny (VISA) members include those who have volunteered their service to Allegheny this or last fiscal year. Timothy Alden Council members are alumni and friends who support the College with an annual gift of $1,815 or more. Reunion Committee Members help to plan their class reunions. Refer a Prospective Student recognizes alumni who have made a referred a prospective student to the Allegheny Admissions Office in a given academic year. 25-Consecutive-Year Donors are those who have made gifts to the College for twenty-five or more consecutive years. The Alumni Medal is the College’s oldest and most prestigious recognition and is awarded for steadfast loyalty and many years of distinguished service to Allegheny. President’s Society honors those individuals whose lifetime giving to Allegheny totals $100,000 or more. Class Agents are alumni volunteers who solicit their peers for the Annual Fund, cultivate relationships with classmates, and encourage them to reconnect to the College. William Bentley Legacy Society members have made provisions for Allegheny College through bequests or life income gifts. Career Mentors are willing to assist students and other alumni by sharing their skills, knowledge, expertise, and professional contacts. Job and Internship Supporters have posted job or internship opportunities in the Job and Internship Database. Social Media Ambassadors volunteer to engage with alumni around the world and with the College on Facebook, Twitter, Instagram, Flickr, and LinkedIn. Timothy Alden Council Executive Committee (TACEC) is a leadership group of generous volunteers who partner with the College to increase participation and financial support to the Annual Fund. Now more than ever alumni can make a valuable and dramatic impact by serving as a Volunteer in Support of Allegheny (VISA). The Volunteer Opportunities page displays current volunteer opportunities that can be viewed in both List and Calendar formats. 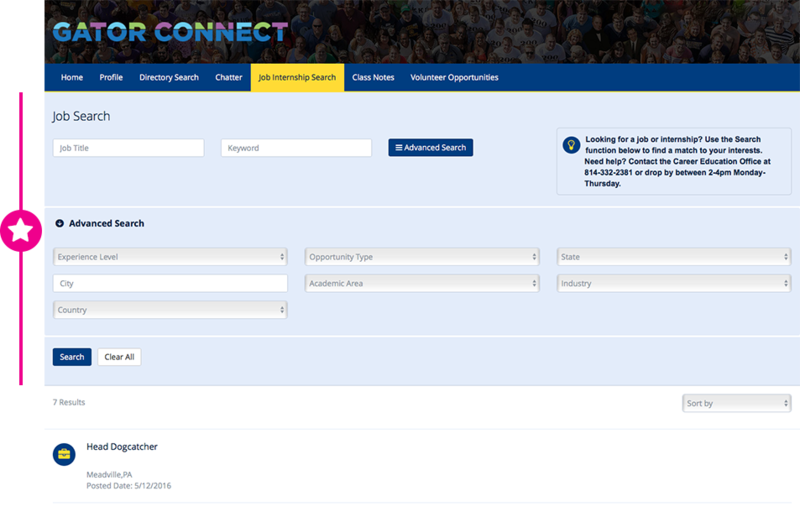 With the click of a button you can sign up to volunteer to help with admissions efforts, assist current students looking for career connections, return to campus to speak with students, and more. You also can share your VISA interests on your Profile page under the Engagement tab. Keeping your interests updated allows us to match you with the type of volunteer experiences you find most meaningful. 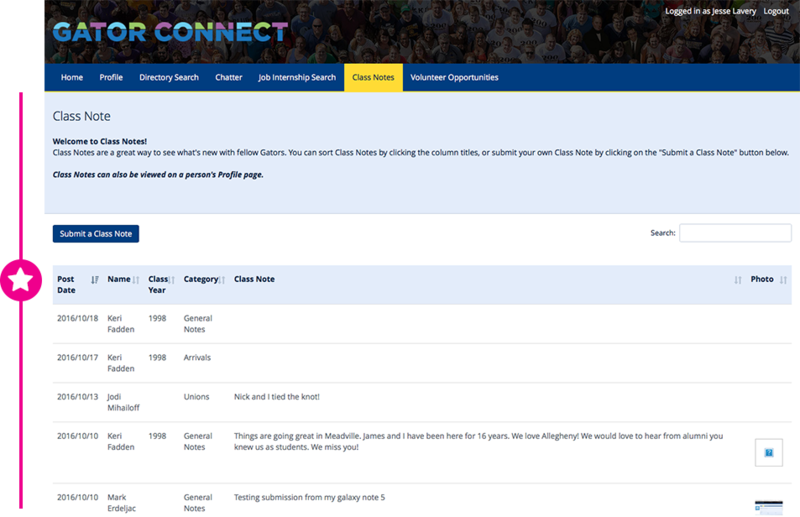 The Job and Internship Database in Gator Connect is exclusively for Alleghenians. It is THE go-to place for Gators searching for a job or looking to fill an opening at their place of business. With your help, Allegheny can have the largest and most dynamic career network of any small liberal arts college in the country. Search by Job Title, Keyword, Opportunity Type, State, City, Country, Academic Area, and Industry. The best way to get results is to search using a combination of two items, such as Opportunity Type and City, or Keyword and Academic Area. Results from your search are automatically displayed with the most recent posting at the top. Results can be sorted in other ways including Date Posted or alphabetically by Job Title or Company. 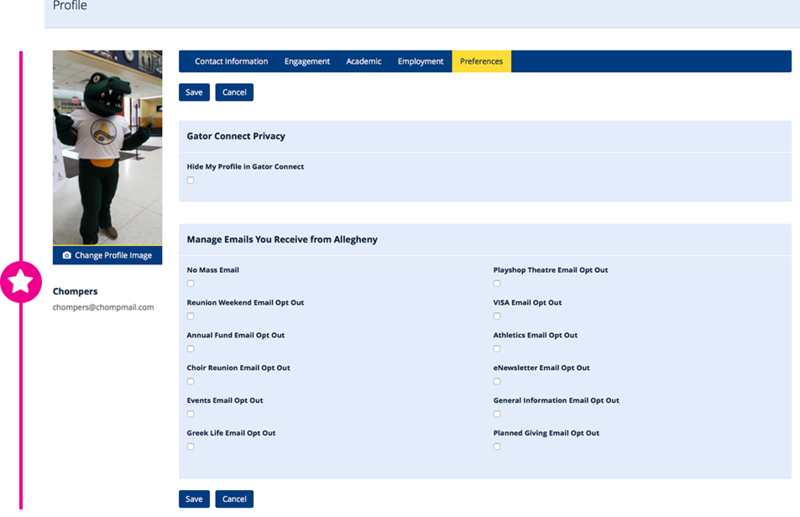 Allegheny Exclusive postings — those from Allegheny connected companies or fellow Gators — are identified by a small Gator logo. Questions about the Job and Internship Database? Contact the Career Education Office, which is part of the Allegheny Gateway, at (814) 332-2381, Monday-Friday 8am-5pm. Everyone loves Class Notes! Click the Class Notes tab located at the top of the page to see what’s new with fellow Gators or to post a Class Note of your own. Class Notes can be sorted by Date, Name, Class Year, and Category. If a Gator has submitted a Class Note you’ll also be able to see it on their Profile page. Chatter is Gator Connect’s own social network that allows Gators to connect, collaborate, chat, and share expertise. Chatter also provides recommendations to help you identify other Gators and groups that closely relate to your interests. In addition, you can “Like” a Chatter post, mention others using the “@John Doe” notation, and view currently trending topics. Chatter Groups fosters collaboration and communication around a specific topic or among members of an affinity group. Click on the Chatter tab located at the top of the page to find existing Chatter Groups, or start a group of your own! Click on Chatter > Groups > New Group. Chatter Groups can be public (anyone can join) or private (Gators ask the group owner for permission to join). Within Chatter groups you can share files, links, or set up polls for group members. You can manage your Chatter Group settings and email preferences by clicking on the Chatter Group name to see more details. Under the Chatter Group photo you will see a links that displays your current email preference. The default setting is “Email Weekly Digest”. To change this option, click on “Email Weekly Digest” and select from the list of options. Removing yourself from a Chatter Group is easy. 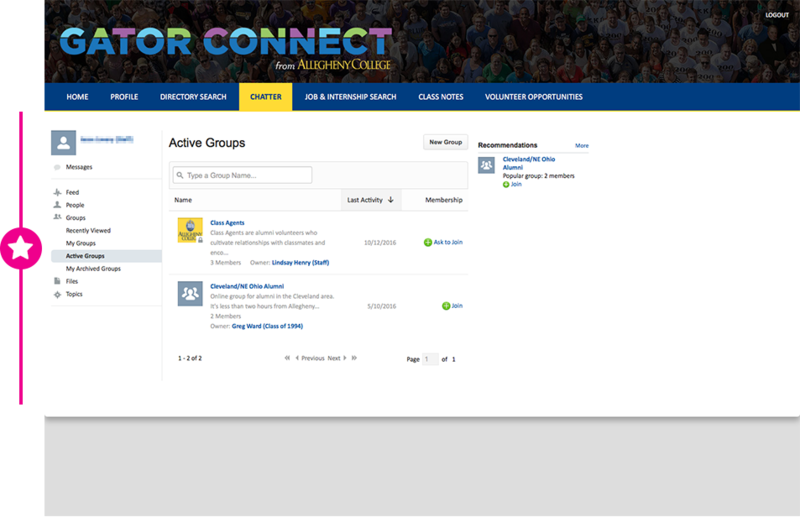 Click on the name of the Chatter Group and look for your membership status on the right side of the page (ex. Member). Click on the X next to your membership status and you will be removed. To make portions of your profile pages private, click the “Edit” button, located at the top or bottom of the page and click the checkboxes next to the word “private” for each of the sections you want hidden from other users. After you are finished, click the “Save” button located at the top or bottom of the page. The Engagement section of your profile is not viewable by other users, therefore you will not find privacy settings on this page. The Preferences section allows you to completely hide your profile in Gator Connect. When you hide your profile, your name will not appear in search results and other users cannot see your profile. To make your profile hidden, click on the “Profile” tab at the top of the page and then click on the “Preferences” tab. Click on “Edit” located at the top or bottom of the page and select “Hide My Profile in Gator Connect” located at the top of the page. When you are finished, click the “Save” button located at the top or bottom of the page. Change your password using the “Change Password” button located on your Profile page. You can also use your other social media accounts to skip the hassle of remembering a separate log in. Gator Connect allows you to sign in using your Facebook, Linkedin or Google account. Maintain the security and integrity of the College’s information systems, including Gator Connect. Sexist, racist and other types of discriminatory, bigoted or hateful comments or images may be removed. Personal attacks, threats or harassment of any kind will not be tolerated. Violators may be removed from Gator Connect or have privileges within the community revoked. Allegheny College reserves the right to terminate a user’s group or page membership, participation and/or privileges, and to remove and discard any posts, comments or other content, at the College’s sole discretion. Allegheny College values your privacy. The College guarantees that the information collected will remain the property of Allegheny College, and it will not be shared with external agencies or individuals for your safety. Please review your privacy settings on Gator Connect and select what information you want to make visible to other Gator Connect users. To the extent permitted by law, the College disclaims all warranties, whether express or implied, including the warranties of merchantability, fitness for a particular purpose, and non-infringement.